PikStik TelescoPik Telescoping Reacher from HealthyKin.com is the most versatile reacher ever. With a simple turn of the locking collar on the shaft, the TelescoPik adjusts from 30"- 44" - making everything within easy reach. I can pick anything up with this product. The jaws work well for me. I loved it so much when I reviewed it back in 2013 that I again purchased one for my up coming second right knee replacement in Dec 2015. 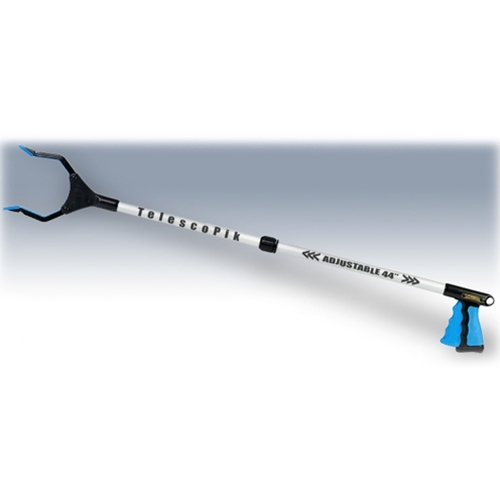 I had trouble going back and worth to the rooms the first couple of weeks after the first surgery to get the grabber when I left it in the bedroom. I plan on putting this second one in my kitchen on a hook. I am also going to purchase two more for other rooms. I know its a great product that makes my life easier after surgery when I can't bend to pick up something I drop on the floor. I swear by this product and am very happy I found it on this web site. Satisfied for the most part, but found jaws didn't close all the way. If you wanted to pick up something slim (a pencil, a coin, etc.) you couldn't do it.